Fossil, the fashion watch maker that is taking a dip in the smartwatch pool, is now selling its first Android Wear device, the Q Founder, on the Google Store. 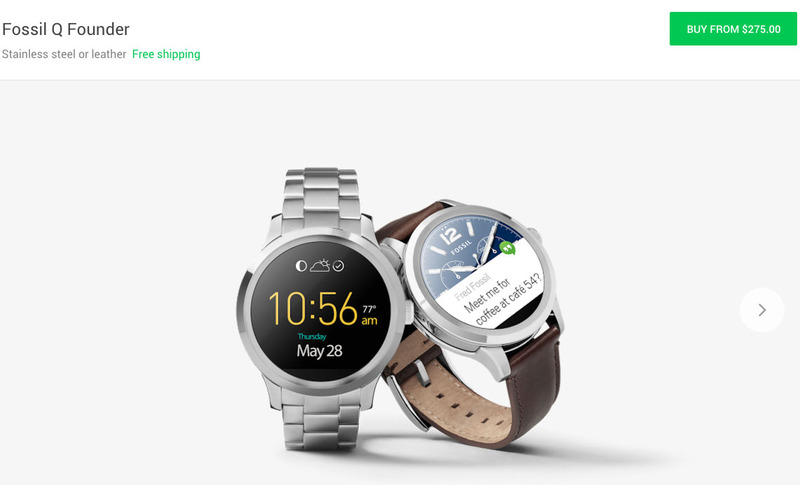 After originally only going on sale through Fossil’s own site, you can now buy this round wrist candy from Google, if that serves a better purpose for you. At $295, the watch is reasonably priced, especially for what you get. Fossil has packed in a 1.5-inch round LCD display (with flat tire and is likely the same as the display in the Moto 360), 38mm case, Intel Atom processor, 1GB RAM, 4GB storage, a stainless steel body, 400mAh battery, WiFi, Bluetooth, IP67 water resistance, and a 22mm quick-release stainless steel band. It’s also a pretty good looking watch. There is also a $275 version with a leather strap instead of the stainless band, but it is not currently available.